“Dunkirk” recalls a World War II mission in which hundreds of civilian craft crossed the English Channel to the French locality of the title to rescue nearly 350,000 members of the British Expeditionary Forces trapped by the German army. “Dunkirk” is the kind of achievement that is generally labeled “towering.” Thankfully, that doesn’t get in the way of it being a great movie. A sweeping re-creation of the 1940 evacuation of nearly 350,000 men — the surviving entirety of the British Expeditionary Forces — from the beaches in northern France where they had been backed into a corner by the German army, the film commemorates a retreat that became an unlikely but profound emblem of national pride. With most of the British Navy’s destroyers held back (to save them for future battles), hundreds of civilian craft crossed the English Channel toward Dunkirk on an unprecedented rescue mission. Fishing boats, trawlers, yachts, dinghies — all ferried soldiers back to England as the RAF battled the German air force overhead. The English army didn’t bring the boys back home — England herself did. That’s the mythology, anyway, and the history as well, and writer-director Christopher Nolan understands he has a project here of more real-world weight than the grand commercial gimcracks on which he has made his name. “The Dark Knight” and “Inception” and “Interstellar” may have been statements of mainstream artistry, but a subject like Dunkirk? That’s a portrait of the British nation at its most sorely tested. Accordingly, Nolan pares his filmmaking style to its essence, resulting in scenes of simple but immensely charged visual momentum. The opening 15 minutes unfold practically without dialogue: a group of British soldiers wandering down a cramped Dunkirk street is suddenly fired upon; only one survives and makes his way through the French defenseworks to the beach, where the film’s scope suddenly widens out onto the epic. Lines of men stretch down toward the water as far as the eye can see, poised to step onto boats that aren’t there and that may not be coming. Despite the wide-open horizons, we feel the panic of a crowd caught in a trap. The surviving young soldier (Fionn Whitehead), named Tommy in the credits, meets another young man (Aneurin Barnard) burying a body in the sand; eventually they’ll be joined by a third soldier (Harry Styles, who your daughters or granddaughters will inform you is a dreamy member of the boy band One Direction). We follow this anonymous trio in their repeated attempts to get off the beach by sneaking onto various boats and ships, ill-fated or otherwise — they are the plebes, the commoners, identifiable by small, telling displays of courage and fear. What’s the best format for viewing ‘Dunkirk’? It depends on what kind of experience you want. The king and his prime minister remain offscreen, but their on-site representative, the highest-ranking officer at Dunkirk, is Commander Bolton, a fictional character played by Kenneth Branagh with a weary stiff upper lip that owes a great deal (and comfortingly so) to the Noel Coward of the 1942 WWII classic “In Which We Serve.” Above him in the skies are the film’s noble knights, the RAF pilots Farrier (Tom Hardy) and Collins (Jack Lowden), their Spitfires chasing down the Nazi’s Messerschmitts before the latter can rain bombs and machine guns on the men and ships below. Most critically, out on the waters of the Channel, chugging doughtily from west to east, are folks like you and me, personified by the terse, middle-class Mr. Dawson, who is played by the invaluable Mark Rylance (“Wolf Hall,” “Bridge of Spies”) and who pilots his pleasure yacht, the Moonstone, toward the chaos with the help of his son (Tom Glynn-Carney) and a dog-faced neighbor boy (Barry Keoghan). “Dunkirk” not only juggles these various theaters of operation but arranges them in three distinct overlapping spans of time: one week for the beach scenes, one day for the sequences aboard the Moonstone, and one hour for the dogfight drama. This means we occasionally revisit moments of the action from different vantage points, or that the waterlogged and traumatized figure (Cillian Murphy) rescued by the Dawsons appears later in the movie — but earlier in time — as an as-yet-unshellshocked soldier. This nested, concentric time structure, three threads of different lengths all converging on the same endpoint, is intricate and impressive — the most obvious mark of Nolan’s ambitions. It’s also more than occasionally distracting, booting viewers out of the film as we briefly but repeatedly are forced to reorient ourselves to the when and the where. Not all movies are built to be immersive experiences, but this one certainly is, and that immersion — a sense that we’re knee-deep in a sacred and defining moment of national character — is most powerful in the first hour, before the chronologies constrict and the crosscutting turns hectic. 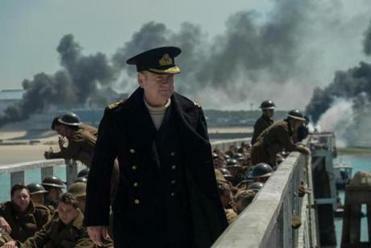 But this is a minor flaw, injurious yet hardly fatal to the overall impact of “Dunkirk.” Knitting the movie together into a singular and cohesive experience are the camerawork by Hoyte van Hoytema — Nolan is one of the last filmmakers still committed to shooting on film, in this case using 65mm Panavision and IMAX cameras — Lee Smith’s splendid editing, and, above all, the score by Hans Zimmer, which feels like some kind of sonic breakthrough. Taken as a whole, “Dunkirk” invites comparisons to the works of Kubrick and Spielberg, but it’s neither as scalding as “Full Metal Jacket” nor as clear-eyed, as aware of war’s terrible randomness, as “Saving Private Ryan.” Instead, a streak of honest sentiment, earned under the most hellish of circumstances, courses through this movie and provides it with spine and a soul. The endpoint of those three nested time spans, remember — the place toward which the entirety of “Dunkirk” points, music and all — is “home.” Nolan takes us there with the full knowledge that we’ll be coming back to fight another day. Written and directed by Christopher Nolan. Starring Tom Hardy, Mark Rylance, Fionn Whitehead, Cillian Murphy, Jack Lowden, Harry Styles. At Boston Common, Fenway, Coolidge Corner, West Newton, suburbs; Jordan’s Furniture IMAX in Natick and Reading. 106 minutes. PG-13 (intense war experience, some language).